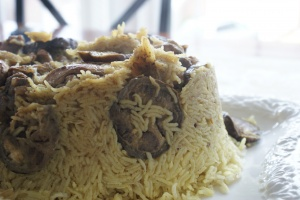 This dish is very famous in Palestine, Jordan and many other Arabian countries make it 2.People can use diff methods 7 diff veggies for it and this is how I have prepared it. If u r pure vegetarian then take out the chicken & use veg broth. 2 large eggplants cut into thick circles (grilled/shallow fried until both sides golden). 1/1 large onion finely chopped and fried till golden. 6 chicken thighs (cooked in 2 c water with and few cardamoms and garlic cloves). 2 cup jasmine rice (soaked for 1/2 hour) & stained. In a non stick deep pot place the grilled Egg plants & potatoes all over the pot and cover the pot with a layer of veggies. Place the chicken over it. Then put a layer of fried onion & parsley then cover it with strained rice. Pour the chicken broth slowly all over the rice just to cover the rice. cook over high flame until it starts to boil. Lower the heat and cook on dum(like biryani) over a metal disc until the rice is nice & fluffy (approx) 45 min. Stand for 10 -15 min then shake the pot a little. Take a large round bowl & turn the pot upside down slowly remove the pot. this way the veg & chicken will be at the bottom and the rice will come slipping out like a cake. Decorate with nuts and serve with Arabian salad & kebabs. Rabz please give me recipe for Sauth ki chutney???? Hi Ritika I always say it is never diff 4 vegetarians to try te same recipe wit veggies all u need is 2 take out the chicken/meat & use just te veggies and veggie broth. For veggies u can use egg plants, potatoes, sliced cauliflower, grilled bell peppers and carrots. These r the veggies the Jordanians & Palestinians mainly use.Keep well, Thanks & cheers. Hi Rabz! I wuld like to try this reciepe , but as I dont eat chicken, can u pls recommend which veggies vl go well in place of chicken. forgot 2 mention plz add 4 tbsp oil to the broth before pouring it over the rice and cover ur rice before u put it over low heat.U can also mix the spices with ur rice then place it over ur chicken & veggies,it is all up 2 u.